Each year, senior class marshals work hand in hand with the Office of University Development to create a student-centered giving campaign. 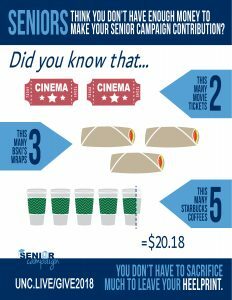 Seniors are encouraged to give during their senior year to the class campaign and, by doing so, are made aware of the institution’s needs for private giving. 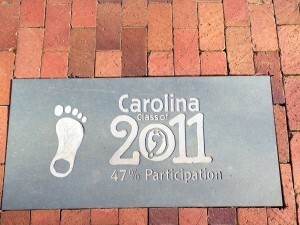 The campaign enables seniors to leave their heelprint on Carolina and make gifts to the areas of campus that they love most. 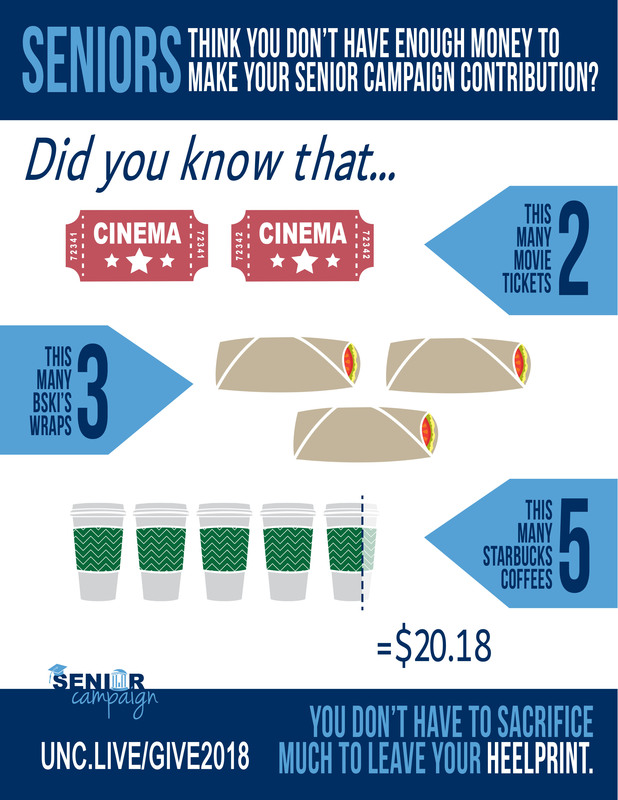 There are thousands of funds to which seniors can designate their gifts. Consider, in academic year 2014-2015, private support from the charitable giving of alumni, students, parents, faculty, staff and friends joined private grants and investment income to provide 17 percent of the revenue needed to run UNC. You don’t have to sacrifice much to leave your heelprint! The Office of University Development and the Class of 2018 marshals encourage seniors to support the area of campus that means the most to you! Gifts made by seniors designated to any University fund will be considered participation in the 2018 Senior Campaign for Carolina. If the Class of 2018 achieves its 48 percent participation goal, they will have topped the Class of 2011’s 47 percent record! We hope you realize how valuable your gift is, no matter the size. Annual gifts help Carolina continue to be recognized as an international leader in higher education. All donors to the 2018 Senior Campaign will be recognized in the Senior Campaign for Carolina Honor Roll. Donors who provide a contribution of $10 or more will receive a Class of 2018 decal (only available through the campaign). Donors who contribute at least $20.18 will also receive a Tar Heel lapel pin to wear at graduation and will be specially noted in all honor rolls. *Only classes with record-breaking participation in the campaign receive a Tar Heel foot on their class stones at the Bell Tower. It’s easy to make your gift now by Visa, MasterCard or American Express. 1. Decide what program in academics, student-life or athletics you want to support. 2. Decide on a gift amount that’s right for you. Remember, you have the option to do automatic monthly or quarterly installments. A giving plan can help you increase the amount you give back to Carolina over an academic year. With a gift of $250 or more in an academic year (July 1 – June 30) you will be granted membership in the 1793 Society, which recognizes leadership annual giving donors. 3. Make your gift online!